Today, if you ask any person who at least had heard about mining, what is needed for this, he will respond — powerful equipment. But an experienced miner knows that it’s far not enough. In order your equipment to function efficiently, you need to take care of its cooling. If you don’t think of it in advance, you risk to failure before even pay the equipment off. Since we got involved in mining with the purpose of getting profit, let’s find out what potholes we will face and how to deal with them. Nowadays the most common way to cool the mining equipment — air conditioning. And at the same time such way of cooling is the least effective. There is far less popular, but far more effective alternative — immersive cooling. It is rather new technology in the mining industry, but we insist that it deserves much more attention. Let’s first answer the question “Since when air-conditioning became inefficient?” — It is efficient. But for home-mining only. Large scales require large cooling system and millions of cubic meters of air monthly. So, if such approach is acceptable for small farms, in case of large scales it will lead to extraordinary high electricity bills. Air conditioning used to be the only way of the equipment cooling, and there were no better alternatives. But now, when there are some other ways, which are much more efficient, they are, at least, worth consideration. For example: ASIC Antminer S9 with a power consumption of about 1350 watts require 4,000 cubic meters of air per hour. As you can see, in order to prevent overheating, you need extra conditioning, which implies extra expenditures on cooling facility, ventilation, professional conditioners, maintenance. Moreover, it will consume additional electricity. At the same time, such problem as the dust still remains. Dust accumulates static electricity, which can lead to equipment failure in the long term. Also, you will have to deal with noise. 1 ASIC generates the noise of 75dB, which is quite acceptable, but if there are 10, 100, or 1000 ASICs, it will cause huge discomfort, especially for a person who looks after the farm constantly, almost 24\7. We all know that profitability of the equipment depends on hashrate. So, the more you overlock your equipment the more effective heat removal system is needed. Here is the thing: different parts of the equipment heats up unqueenly. Moreover, due to the lack of thermal stability in case of air-cooling, the constant functioning negatively affects the lifespan of the devices. Nevertheless, despite the described problems, miners are still not enthusiastic about experimenting with new types of cooling, because all of them used to be unprofitable and weren’t without shortcomings: high cost, complicated constructions, low equipment density placement. But now, with the development of the mining industry, more innovative and effective approached to cooling has appeared. 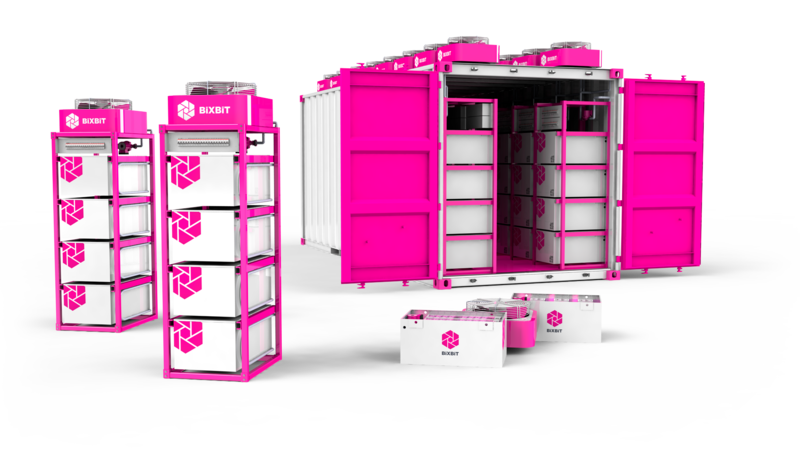 BiXBiT company has made a lot of research and is ready to present its own way of cooling — a complex solution for mining equipment placement, based on the impressive cooling system. Such approach allows to solve the main problems of the mining industry. The thermal conductivity of the liquid is 25 times higher than in case of air cooling, which significantly increases the degree of thermal stability within the installation. Due to this, the equipment lifespan increases and corresponds to the time declared by the manufacturer (and in some cases exceeds). For example, a processor’s temperature at full power usually reaches 85 ºC, at an ambient temperature of 32 ° C. If we immerse the processor into the liquid, its average temperature will be about 65 ºC under the same conditions. Such high degree of thermal stability and heat conductivity allows to exceed the maximum power of the equipment, which will increase its productivity by 20–40%, depending on the tasks assigned. Immersive liquid eliminates the key problems of the equipment failure: temperature drops due to the unevenly cooled air supply and overheating. Also, using the liquid makes dust accumulation impossible. One more advantage of immersive liquid is a high density of the equipment placement. A standard 10-foot ISO-container can contain 2.5 times more ASICs and 6 times more GPUs than in case of using air-conditioning. As you don’t need to install extra ventilation and professional cooling system, create cold and hot air-corridors, you save lots of space which can be used for the equipment placement. Also, since you don’t need all this extra conditioning, it significantly reduces electricity consumption, which saves over 20% of previous expenditures. For example, using 192 ASIC devices, with a cooler power consumption of 70W, will save almost 10,000 kWh per month using BiXBiT complex, based on the immersive cooling system instead of a common air-cooling system. Moreover, BiXBiT installations work noiselessly, thanks to eliminating the regular cooling systems of devices. Overseeing the current market situation, we can see that there is no better alternative to immersive system cooling according to price-to-quality ratio. As a result, the BiXBiT approach to equipment cooling allows to reduce electricity consumption, exceed the lifespan of the equipment, and increases its productivity. By the way, immersive cooling is safe, noiseless, eco-friendly and does not require special maintenance or frequent replacement.